As Hillary Clinton tries to ward off a grassroots primary challenge, she has adopted energy policy views significantly to the left even of her own campaign chairman. Clinton said during Sunday’s Democratic presidential debate that she would impose highly restrictive regulations on hydraulic fracturing, the oil and gas extraction method commonly known as fracking, making it practically or economically infeasible in most cases. "By the time we get through all of my conditions, I do not think there will be many places in America where fracking will continue to take place," Clinton said at the debate. Clinton’s energy policy could significantly limit U.S. energy supplies: fracked wells are responsible for about half of the country’s domestic oil and gas output. Similarly hardline energy policies drew the ire of Clinton campaign chairman John Podesta just years ago. Podesta criticized environmental opposition to fossil fuels in general as "completely impractical" in 2014 remarks to reporters. Podesta has also defended fracking as "a bridge, if you will, from a world in which there’s still a need for fossil fuels to power our economy." 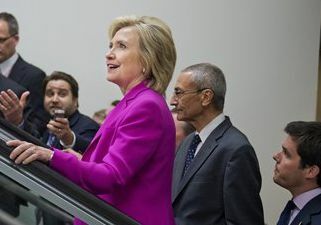 Though Clinton did not reject fracking outright, her prediction that it would be dramatically scaled back due to the measures she would impose is a significant departure from Podesta’s position. That position also aligned with the Obama White House’s. When Podesta made those remarks he was serving as a senior energy advisor to the president, who has declined to crack down on fracking and attempted to take credit for the resulting oil and gas boom. Though Clinton’s departure from that position will likely please the environmentalist base of the Democratic Party, critics say it will cost her politically. "Under her new rules, fracking would exist almost nowhere because of the rules she wants to put in," conservative activist Grover Norquist said in a Monday interview. "Democrats used to be able to insult the energy industry because they lived in Texas, Oklahoma, Louisiana, and Alaska—they don’t vote Democrat," said Norquist, who leads the group Americans for Tax Reform. "But she declared war on Pennsylvania and Ohio with that statement. That’s not the way to win the election—that’s how you lose it." The Clinton campaign did not respond to a request for comment on the seemingly divergent views on fracking of the candidate and Podesta. Prior to his stint at the White House, Podesta led the liberal Center for American Progress, which is financially supported by Pacific Gas and Electric, a natural gas-focused utility that helped produce a report in 2014 that dubbed fracking "the most promising development in the North American gas supply picture in the past several years." Podesta also cofounded a lobbying firm with his brother, Tony Podesta, that pushed for an export terminal to ship fracked natural gas overseas. This entry was posted in Issues and tagged Center for American Progress, Energy, Energy Policy, Fracking, Hillary Clinton, John Podesta. Bookmark the permalink.